iPhone X or iPhone 8: Which one should you pick? Apple has made it harder than ever to chose an iPhone. In addition to launching the iPhone 8 ($34.50 at Apple) and 8 Plus this year, the company added a super-premium iPhone X to its lineup. So, what are the differences between the three phones and which one should you buy? While we haven't reviewed these devices in-depth just yet (stay tuned, because they're coming soon), we took a look at the seven most important factors you should consider, at least on paper, before you decide what to buy. iPhones have never been cheap, but this time you could end up spending almost $1,500 on one. 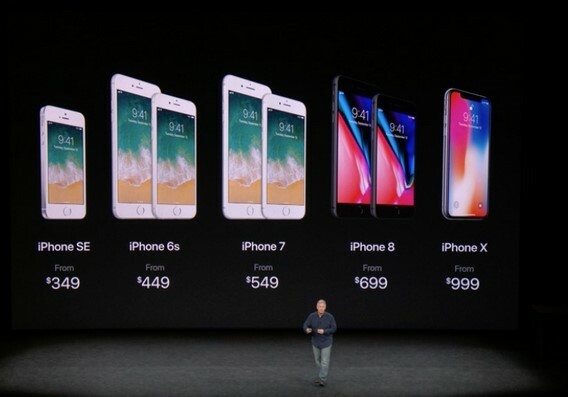 The iPhone 8 starts at $699, £699 or AU$1,079, the Plus at $799, £799 or AU$1,229 and the cheapest X will set you back $999, £999 or AU$1,579. That's before tax, Apple Care and extra storage. So if you're on a tight budget you may as well rule out the X from the get-go. Or consider the Apple Upgrade Program which lets you pay off your phone over a 24-month period and upgrade to the latest model once you've made half of those payments. If price is not your main concern, the next thing you should think about is size. The 8 Plus gives you a bigger 5.5-inch screen, but it's significantly bulkier. The 4.7-inch screen on the 8 is more comfortable to maneuver with one hand, but you sacrifice almost an inch of screen real estate. The iPhone X lands in between the two in terms of size and weight, but it has an even larger 5.8-inch screen, thanks to that nearly bezel-less design. A lot of swiping, but no home button on the iPhone X. All three iPhones have Apple's True Tone technology which adjusts the warmth of the screen to ambient lighting. But the 8 and 8 Plus have HD Retina Displays like their predecessors and the X has a Super Retina Display with more pixels per inch. It's also the first iPhone that uses OLED and HDR technology for its display, which produces deeper blacks, richer colors and more life-like images. The downside is that you'll have to put up with that unsightly black notch and rounded edges when watching videos. What you won't find on the X is a home button. Apple removed the button, which means you'll have to learn a new way of controlling your phone based on gestures. So, if you're particularly attached to the physical home button, you may want to go with the 8 or 8 Plus. In addition to the home button, the fingerprint scanner on the iPhone X disappeared. It uses FaceID to unlock the phone and authenticate payments, which according to Apple is even more secure than TouchID. While it may be safer, it doesn't seem to be as convenient as placing your finger on the phone -- a gesture that has become second nature to iOS users by now. By comparison, the 8 and the 8 Plus keeps the fingerprint scanner on the home button. If the camera is most important to you, then go for the 8 Plus or the X. Both phones have a second telephoto lens for better zoom and DSLR-like portraits. Plus, Apple added "Portrait lighting" to Portrait Mode, which mimics any kind of studio lighting to make portrait shots look much better. The X also has a slightly faster aperture and optical image stabilization on both lenses. And if you're a selfie lover, it does Portrait mode on the front camera too. All three phones come equipped with Apple's AR kit for immersive gameplay and interactive apps. But the TrueDepth camera on the X's front side takes it a step further with a special setup for face mapping. This can transform you into your favorite Snapchat filter or an Animoji version of yourself. If your current Phone is on its last leg and you can't wait another day, then eliminate the X from your wish list. Apple's 10th anniversary iPhone won't be available until November, and that's if it's not on backorder. So if you need a new phone sooner, you can preorder the other two phones on Sept. 15 and have them in your hands by Sept. 22. 0 Response to "iPhone X or iPhone 8: Which one should you pick?"